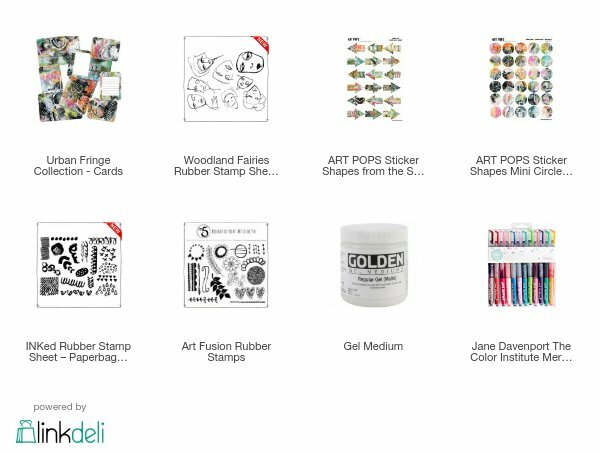 UPDATE: Paperbag Studios stamps and Art Pops™ are no longer available, but many things can be substituted to make this project! Get creative and have fun! I really enjoy working in smaller journals. These journals in particular are not big and the pages do not take a lot of time. Plus I make them, so they are very cost efficient. I’m a big proponent of using what you have where you are at. Don’t wait. Just get started. When I start a journal page, and I know this probably sounds bad, but I really do not put a lot of thought into it. I just start adding paint and inks and stamps and layers, whatever I want. With this one in particular, I knew I wanted to incorporate an Art Pops™ card and the Woodland Fairies stamps. And that is about as deep as my thought process got. As you can see in the video I try the ArtPops card in various positions until I found where I liked best. Then I just added layers from there until I liked the end result. Art journaling, for me, is not about copying someone else’s style or making it look perfect. It's my time to be free of rules and expectations of what someone else thinks I should be doing and just let it flow. This is really the basis of my ‘method’. There are certain things I almost always add, like book text and teal paint, but for the most part I just let whatever happens happen. I think this is a great way to create, there is less pressure this way. What's your top tip for dealing with blank page paralysis? My tip is a messy (maybe applied with a palette knife) layer of gesso or white acrylic paint. Let that dry, then add ink spray! Just pick and color and spray. The spray sinks down into the texture of the paint and makes great texture. No more blank page! What do you do with your art once you've finished it? I hoard it of course! lol Most of what I do is in journals. I have a stack of journals under my work table. They are stuffed and gloriously chubby. I love the way it looks. Want Access to My Library of Resources for Artists + Makers? all free - all for you - want in?